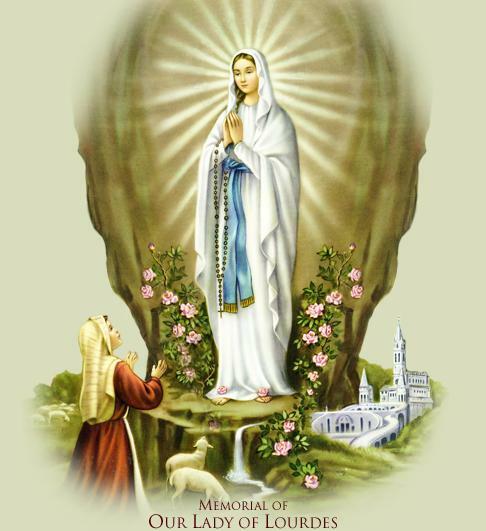 On February 11, 1858, the Blessed Virgin Mary appeared to Bernadette Soubirous. This began a series of visions. Bernadette was a sickly child of poor parents. Their practice of the Catholic faith was barely more than lukewarm. But the Blessed Virgin Mary made her an instrument to revitalize the faith of millions of people. In 1862, the Church confirmed the authenticity of the apparitions. Lourdes has become a place of pilgrimage and healing, but even more, of faith. It is Jesus’ healing power performed through the intercession of His beloved mother, the Immaculate Conception. The message of Mary to Bernadette was a call to personal conversion, prayer and charity. This message still holds true at our present time and age. February 11 was proclaimed World Day of the Sick by St. Pope John Paul II. For its part, the Health Care Ministry will sponsor a healing mass on Wednesday, February 11 at 7:30 a.m. in the main church.